the Slaw and the Dipping Sauce. Enjoy!! Mix all ingredients together. To use roll logs of Ahi in marinade and sear in hot wok or hot skillet 30 seconds per side. Slice and serve with Dipping Sauce and Slaw. Make a thick paste with the water and wasabi powder. To this paste, add the liquid ingredients and mix well. Sliced as directed and mix all ingredients together. Chill until ready to serve. Divide into portions. 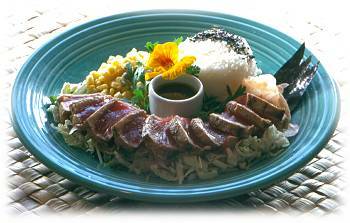 Top with seared, sliced ahi.